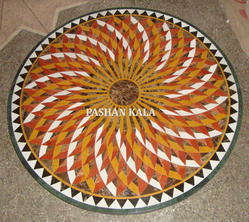 Words fail to explain the beauty of this Round Mosaic Table Top with unique inlaid design. Perfectly matches with any kind of room's decoration. 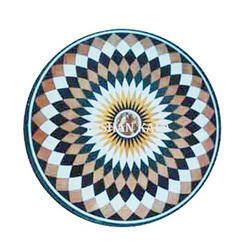 Also available in rectangular and square shape as well as in marble.This Round Black & White Marble Inlaid Table Tops is suitable for center tables, side tables, coffee tables, marble center table tops and phone table. • Designs : Traditional flooring mosaic. • Marbles and stone : Black, White, Green and Semi precious stones, Indian marbles, Italian marbles use for Mosaic. 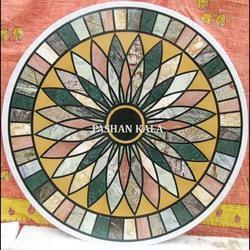 Our organization is offering a comprehensive array of Decorative Mosaic Table. Available in a wide variety of shape and size, our range is acclaimed by the domestic and overseas client. We strive to provide our Mosaic Table as per client specification, in order to cater to their exact needs. •Different sizes 12 to 60" inches. •Shapes : Round, Rectangular, Octagonal, Oval, Square etc. •Designs : Traditional flooring mosaic. •Marbles and stone : Black, White, Green and Semi precious stones, Indian marbles, Italian marbles use for Mosaic. •Use : Dining table, Coffee table, Center table, Side table, Kitchen table, Bar table and Indoor and Outdoor. We manufacture high quality Marble Mosaic Coffee Table Top that are available in different sizes as per the specific requirements of our esteemed clients. These Marble Table Top are manufactured using the latest technology and machine to ensure that these are of premium quality. 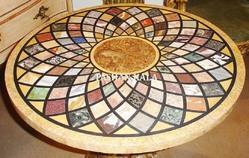 Our Mosaic Table can be availed at industrial leading price. Looking for Marble Mosaic Table ?